The vent went over a wall stud. You may not know this, but wood is not super great at allowing air through it. He either didn't look up from the basement. Or, if he did, he didn't mention that the duct in the basement wasn't connected to anything. That it dumped into a cavity in my wall. Which was blocked by insulation. In the course of my bathroom renovation, my contractor had also talked me out of heated floors. It was going to cost $1500 to install them, for some reason. "Just put down a rug," he suggested. Yes, a rug over my nice new marble mosaic tiles. Perfect. But I went with it, thinking that maybe the floor wouldn't be that cold anyway. Remember, I didn't know what I didn't know, back then. A few weeks back, my dad had some time on his hands so he offered to come over and remove the blockage from the duct (all part of the insulation/heating project I've been working on). He worked and worked with various methods, trying to pull it all up. It was insulation, all right. But it wasn't coming up very easily. And then we pulled up some electrical. Oops. That's when we switched tactics. We went to the basement to take the elbow off the duct. We were just going to dump the debris out of the duct. Instead, the elbow dropped down into my dad's hands. And there was nothing attached to it. Off went that arm of the furnace. And my dad went home. Bigger job than we'd thought, alright. Then my parents were at a family get-together with my uncle, and my dad starts talking to him about the surprise lacking-duct situation. My uncle offers to help fix it up. He's the fixer in the family. He just knows how to do stuff. He was the brains behind the chimney project in August. And the repointing of the bricks under my front doorstep and filling the foyer's door frame gap last fall. So we decided on the this weekend to undertake Project Duct (Quack!). Actually, they were going to arrive Thursday and be done by Friday. It's now Monday and they just left. Talk about Family Day weekend! 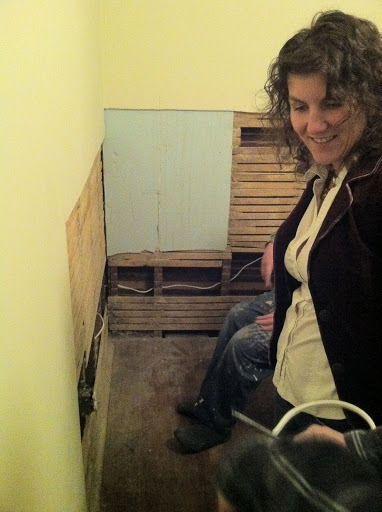 Thursday, they had scoped out and planned the project: open a small hole in the guest room, behind the bathroom vent, reposition the vent and cover up the holes. Drop the duct-work down. Done. Friday, I returned home from work to huge holes in the guest room walls. As they were opening up the wall, they found weird old electrical that I didn't even know what there. Buried in the drywall. Amid much construction debris that had filled the cavity, mind you. Day one now meant removing the suspect electrical. And debris. Unexpected surprise. But fixed now. They'd also decided that my under-counter lighting wasn't done right and set about fixing it. Obviously, this wasn't going to be done in two days. My mom arrived on Saturday morning to help with the cooking and cleaning and grocery shopping and gophering for the project (multiple trips to Home Depot). They had to open up the wall in our dining room (see the hole all re-drywalled here) to fish the duct down the cavity. But it all worked out. Then it was time to put the walls back on. I got to help at least. Drilling, yay! Over dinner we were talking about my uncle's work on my cousin's house. He mentioned something about how the fixtures weren't caulked. Could we BELIEVE that? All that water was just dripping back into the wall! Gulp. I mentioned how my NEW tub spigot had had a gap where it came out of the wall. I'd noticed and asked my contractor to fix it. However, I thought he'd just shoved it further back into the wall and figured that was normal, so I didn't say anything. He immediately got up to look. He came back saying that he'd open up the wall the next day and stabilize the spigot against something so it wouldn't move and then caulk it. Another project. Before the bathroom project is even completed and paid for! And then he mentioned the floor joist. Crumbling dry-rot, he said. My face must have fallen even more, as Gordon and my mom asked him to stop talking about it. They're coming back soonish to fix that one too, they say. I have to remain positive. In the end, I have improved under-counter lighting, a heated bathroom and guest room as well as a water-tight shower! The walls are re-drywalled and just drying. Next week, my uncle returns to do the final, finishing touches on the wall. Total project cost: $300, plus food -- not bad! So we can move onto the next project in the spring. The landscaping. I mean, the upper cupboard molding. Or was it the crappy ceiling in the main room? No, wait, I forgot, the floor joist. So we don't fall through... And that master bedroom project? The one where I finally have room to get out of bed and have a lamp within reach and painted walls? It'll wait. For next year.